Philadelphia 76ers center Joel Embiid looks on against the Washington Wizards during the second half at Capital One Arena. 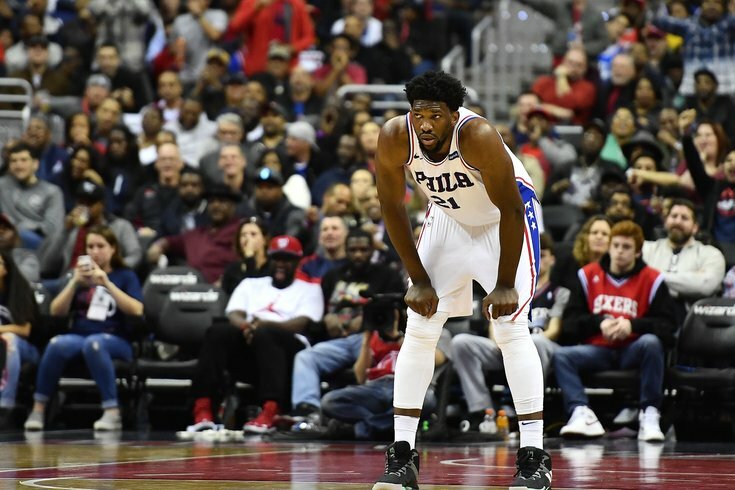 After losses from the Milwaukee Bucks and Cleveland Cavaliers on Sunday afternoon, the Sixers were primed for a big evening in Washington D.C. A win against their opponent to the south would have vaulted the Sixers into fifth place in the East and within 1.5 games of the Cleveland Cavaliers, currently in possession of the No. 3 seed. This would have seemed unfathomable just two months ago, but a brilliant start to 2018 has the Sixers within reach of favorable seeding come playoff time. But when it was time to seize the moment on Sunday night, the Sixers just didn't have the legs. Playing their third game in four nights and the second half of a back-to-back against a rested opponent, the Sixers fell to the Wizards 109-94 in D.C.
You can't really point the finger at any player in particular for the loss because even the oft-celebrated starters had down nights at the office. The numbers for Ben Simmons and Joel Embiid were nice — 16-8-8 for the former and 25-10-4 for the latter — but even with the pair on the court, the Sixers struggled. They have been good enough to drag the Sixers to victory more often than not this season, but Sunday night they felt a step slow, a dribble too far, not quite able to get it done. Their games still should have been good enough if the Sixers' shooters did absolutely anything to aid them. Instead, Dario Saric, Robert Covington, JJ Redick, and Marco Belinelli combined to shoot 7/27 from downtown and 12/44 from the field, missing open shots and bunnies at the rim far too often. Even when the Sixers came up with big stops and got out on the break, they struggled to capitalize on the opportunity. With several opportunities to cut down Washington's lead and make it a ballgame late, Sixers wings badly missed momentum threes, a problem that has hurt both their comeback attempts and their ability to maintain big leads when they've built them. Considering how badly they shot, it was a minor miracle the Sixers were able to cut the lead to single digits down the stretch of the fourth quarter. But on an evening when the Wizards passed the ball well and made 48 percent of their shots from deep, this effort was never going to be enough to win. On the rare occasion when the Sixers were crisp on the defensive end, Washington bailed themselves out on offense with some ridiculous shotmaking, and eventually it was clear it just wouldn't be Philadelphia's night. "They made tough shots, they made shots at the end of shot clocks, I think six times or five times," said Brown. "I give the Wizards credit when you look at what Oubre did, you look at what Porter did, you look at what Beal did, those are impressive numbers ... Tonight was always going to be hard, coming into Washington on a back-to-back, we looked forward to it. This is very much a playoff-type situation in regards to the mental toughness you need to have." The mental sharpness just wasn't there, and there were far too many plays where Sixers players just flat-out missed or reacted late on rotations. The Wizards made them pay more often than not. These sort of games happen, and no one should overrate or overvalue what a single loss means in an 82-game season. Still, it represents a major missed opportunity for a team that could have continued their surge up the standings, and they have a bunch of back-to-back games left between now and the end of the season. Easy schedule or not, they have to offer up better efforts than this. Down 19 at halftime and with the team clearly in need of a spark off the bench, the obvious move from the outside looking in was inserting Richaun Holmes into the game. Playing Amir Johnson has its merits when the Sixers are simply trying to hold down the fort and maintain a lead, but he's not the sort of player who is going to help you disintegrate a large deficit. Yet when it was time for Embiid to get his first sub of the second half, in came Johnson to play the second-unit minutes. Even as someone who generally understands the coaching staff's preference for Johnson on a night-to-night basis, it was a puzzling decision and one I openly questioned as it was happening. This is another situation where I don't really get going to Johnson over Holmes. Team obviously needs some kind of change of pace, treading water without Embiid is not going to cut it. Eventually, Brown would relent and he turned to Holmes with just over three minutes to play in the third, using him as a bully-ball four alongside Embiid. The move paid dividends almost immediately, with the Sixers closing the quarter on a 13-4 run and giving themselves a puncher's chance. This is a lineup configuration that I still think would get exposed in larger samples, but with another shooter on the roster in Belinelli, it has become easier to get away with playing Holmes as a four. And while we have to keep the small sample size in mind, it's also worth acknowledging how much more successful the Embiid-Holmes pairing has been than the Embiid-Booker pairing so far this year. Note: Numbers are for five-man units containing these combinations. That offensive efficiency with Holmes alongside Embiid is staggering, and represents a figure in the 99th percentile of all five-man units this year, per Cleaning the Glass. But the question with Holmes at the four (and in general, frankly) has never been about finding a way to contribute on offense, it's always about defense. For the second straight game, he acquitted himself just fine on that end of the floor. Holmes' problem has never been about lacking tools, but whether at the rim or on the perimeter he has struggled to repress his urge to chase blocked shots. But in the action we've seen him in lately, Holmes has done a better job of not biting on shot fakes, using quick feet to stay in front of his man without fouling. A report Sunday from Yahoo's Shams Charania alluded to the return of forward Ersan Ilyasova to Philadelphia, though with his buyout not yet finalized the team has yet to comment out of respect for NBA tampering rules. Ilyasova rejoining the Sixers would make it even less likely for Holmes to get minutes at the four, and it still looks like a long shot that he'll be a regular member of the rotation. But look, at this point, I think Brown has to find a way to get him involved one way or another. When guys routinely give you energy off the bench in ways that can and can't be quantified, you have to respond. The Sixers were a much better team with Holmes on the court Sunday, and he deserves a chance to prove that will be the case in a larger role. Dear god, what was that officiating? Before we get started here, an important caveat: the officials were not the reason Philadelphia lost by any stretch of the imagination. They called needlessly soft fouls on both teams from the opening whistle, and Washington shooting the ball much better was what earned them the victory, full stop. That said, holy cow was that a hatchet job from the officiating crew in D.C. on Sunday night. This shot, which is visibly and obviously still in Otto Porter's hand with the shot clock at zero and the giant, bright light going off on the backboard, was ruled good and never reviewed. That is hilariously, comically bad on the part of the officials, and is symptomatic of a problem the league has dealt with all year. Judgment calls are one thing, and every referee is not going to call a game the way you or the players might prefer it. As long as they're consistent in the manner in which they officiate, that's all any objective party can ask for. But all around the league this season, officiating quality has been poor. The NBA is by-and-large a great product with lots of compelling stars and teams, and it shouldn't be this hard to find officials who can get very basic things and calls right. Hell, we're only a couple weeks removed from a separate shot-clock controversy, when Tony Brothers waved off a Simmons make before the buzzer sounded. The NBA comes out every year with new points of emphasis for officials, and their tweaks to continuation this year have been a major success. But if their guys are going to botch basic-level stuff in a regular season game with small stakes, it doesn't inspire much faith in their ability to make tougher calls in the playoff pressure cooker.